The Nokia Asha 310 has just been unveiled and it is the first extremely affordable feature phone in the Asha lineup to feature both dual-SIM and Wi-Fi connectivity support. The Asha 310 is a compact device with a 3-inch WQVGA (384 x 240 pixels) display running on Series 40. It is a feature phone, but Nokia has a partnership worked out with EA so you get 40 very basic games for free. The Nokia Asha 310 comes with microSD card support for up 32GB of additional storage, and 2G GPRS/EDGE connectivitiy alongside Wi-Fi and Bluetooth 3.0. Charging is done via a proprietary 2mm pin. On the back, there is a basic 2-megapixel camera. Overall, this is clearly a device for developing markets in Asia, India, the Middle East, Africa and Brazil, where it will arrive in Q1 2013. 3-inch WQVGA? why not 3.7"? 4.0"? 4.2"? i just don't understand. A bigger screen means a higher price, and, I'm sorry to say, not everyone can pay more than $100 for a phone. I don't know why people are bashing this phone, this a dumpphone for country's like India etc etc. These phones are very populair there, a lot of people are poor so they cannot afford a high end phone. 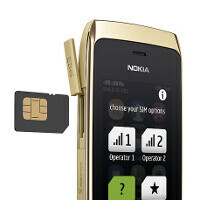 These phones are nice , and Nokia made a good step with these dumpphones! It will cost around 100 dollars......so what do you want for that? So think before you diss! NO--kia, u know it MUST HAVE BEEN SYMBIAN 6.0 3rd generation so consumers will still buy ur feature phone. just comparison between ur s40 os phone with s60 os phone on your own. why did u insist to push that ¢®@p os to ur consumers/custumer? really dissapointed. at least revive the n70 era with now affordable price phone. Fyi, with us$ 800, u can bring android SMARTPHONE with 3"/3.5", wifi, HSDPA, GPS and 2mpx back camera, so this is really-really NO--kia! ooops... i meant us$ 80 (IDR 80 x 10.000 - rounded = IDR 800.000) sorry, my faults. Design is Good but The os is very Bad.. Come on Nokia.. Forget about s40 and symbian os.. Just Move on!!! S40 isn't Symbian... it's Java-based only. They HAVE forgotten about Symbian. S40 devices are about the highest functioning Java-based phones there are these days. BREW MP will probably displace them, in time, but that is only because BREW MP offers a lot of the functionality that S40 does, but with decreased UI complexity and increased display eye-candy. S40 does more... but BREW MP looks prettier. Either way, S40 will likely go away when BREW MP is more affordable, and all Java-based-only devices will likely dry up at about the same time, too. Personally, I prefer S40, but there are plenty of people who disagree with me (most of my fellow US citizens, in fact). I find that to be a sad fact of the American marketplace. and yet, sony ericsson java-based phone is more capable to running every apps and even 3d java games such as galaxy on fire 2, rally pro, final fantasy 3 (mobile), project gotham race which in nokia, even s60 the games are sooo laggy. so, please, give your costumer and consumers at least s60, so they get multitasking just like on sony ericsson java-based phone. Ha... that'll never happen. Nokia has been paid off to bury Symbian soooo deep that it will never resurface. And it's a good thing I never played games on my S60 phones. I've never had any major problems with anything I've done on S60, and I just never felt like playing games on my phones. I had better things to do with my time and devices. Just the same, I am not familiar with Sony Ericsson's Java implementations, and so I cannot speak for their Java-based devices being any better or not. I'll just have to take your word for it.